This patch is now live on PC, but PlayStation and Xbox players will have to wait — and deal with super-survivability Bastion — for a while longer. Developer Comments: After introducing the new Ironclad passive ability in the last patch, Bastion felt a little too difficult to deal with. This reduction maintains his survivability while he’s transformed, but he shouldn’t feel so overbearing to enemies. Developer Comments: This change is actually reverting an attempted bug fix from a previous patch. 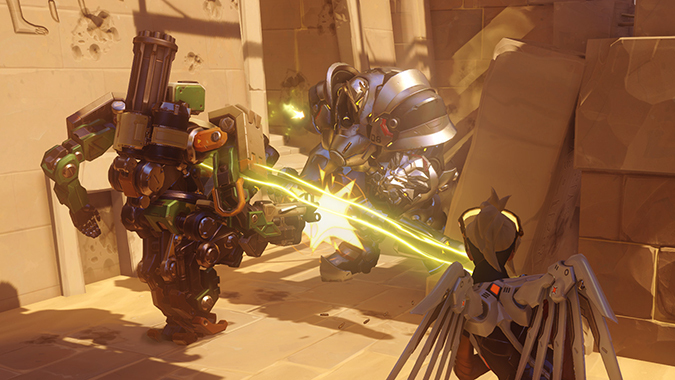 Now, Zarya’s barriers no longer protect players who are hit by a knockback effect that pierces the shield. This change does not affect knockback abilities that occur outside the barriers. For example, if Zarya has a barrier on herself and is hit by one of Pharah’s concussive blasts, she won’t be affected, because the barrier blocked the effect. However, if Winston uses his ultimate and starts to swing at Zarya, it will now knock her back even if a protective barrier is active, since melee attacks pierce barriers.